Are you seeking a luxury campsite in one of the most beautiful spots in Dordogne, France? Are you seeking a luxury campsite in one of the most beautiful spots in Dordogne, France? With a wealth of amenities and uber-lux accomodations, Le Paradis offers a delightful place to base your French adventure. So don't delay! Book your next to Le Paradis, and you will be sure to have a magical and memorable camping holiday. Why Should I Camp in Le Paradis Campsite? Aside from the luxury camping options and fab facilities, Le Paradis also enjoys a prime location near the charming town of Montignac. A stay here will also place you within easy reach of Maison Forte de Reignac, the caves of Lascaux and a large aquarium. A highlight of this luxury campsite has to be the large lagoon-style swimming pool which is set in manicured gardens. There is also a separate kids pool which provides the perfect spot for your little ones to splash around. Sun loungers and plentiful and free, plus guests have access to the spa area which has a steam room, sauna and Jacuzzi. There are a host of amenities that will keep the family entertained, including a children's disco, bingo, aqua gym, evening shows, games room with pinball and video games plus a TV room. Laundry and sanitation facilities include hot showers, washing machines, dryers, landry sinks and iron hire. WiFi is available throughout the luxury campsite, and computer-based internet access is also available. The friendly staff are multilingual, and payments can be made with all major credit cards. There is a small grocery store on-site which sells toiletries, condiments, drinks and snacks. A weekly market is held in the nearby town center, and its there where you can purchase fresh produce and local goodies. 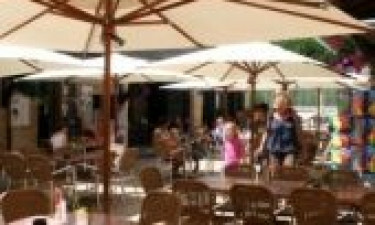 Le Paradis has its own restaurant which is located in the courtyard area of the campsite. It has a beautiful terrace space which lets you enjoy you meal al fresco during the warm summer months. There is also a bar which offers a nice spot to enjoy an ice cold beer, wine, soft drinks or handcrafted cocktails. A number of cafes, restaurants and ice cream parlors are located just a short stroll away from the luxury campsite. The recently modernized mobile homes are stylishly designed and have a large social living space. The mobile homes have two bedrooms: one with a double bed and another with a bunk bed. Modern amenities such as iPod docking systems will help to keep everyone entertained in-room, while other features include a hair dryer, blackout blinds, and the option to pre-order towels and bedding. Cooking up a storm is easy, as each LUX-camp mobile home in this luxury camping site has a kitchen area with microwave, full-size refrigerator, oven, grill and gas hob.